Here I am at Crieff again. This time I am attending a Guidance Conference, a retreat to help students discern whether they might be called to become Presbyterian ministers. I am one of six counsellors (four of us are parish ministers) and I will spend my four days interviewing, observing and writing reports on several students. 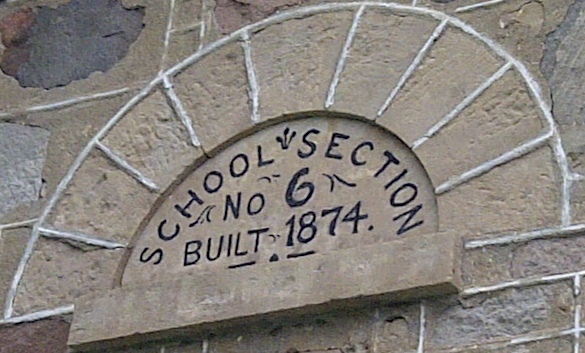 Crieff Hills Community, as it is formally called, is a beautiful place with a rich history. There are hiking trails, a labyrinth, and a series of buildings used for retreats. Near the main entrance an old school house functions as the dining area. Several nearby buildings (named after Matthew, Mark and Luke) have overnight accommodations and large rooms for meetings. Farther afield there are small homes (named Dove, Hermitage, Prophet, and the like) that let small groups stay overnight. Larger outdoor spaces like the amphitheatre, campfire pit and picnic shelter often host school and community groups. Not surprisingly, I have noticed what is growing here. 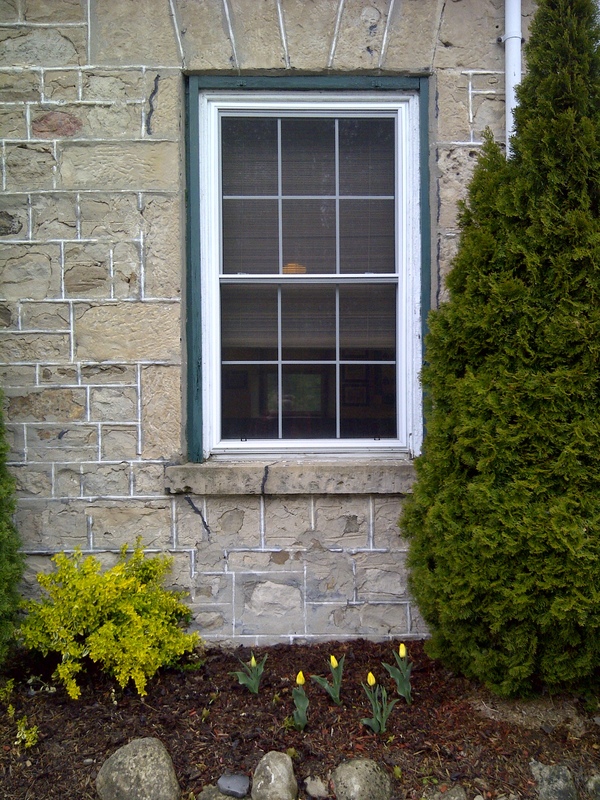 Near the side windows of the old school building there are lovely kept flower beds with precisely planted tulips. Farther along there is a small hillside patch where narcissus and snow-on-the mountain are blooming just now. Some years ago, an intentional quiet space was built between two of the main buildings and although the stream and pond seem a little neglected, there are remnants of ajuga, iris, liac and sedum. 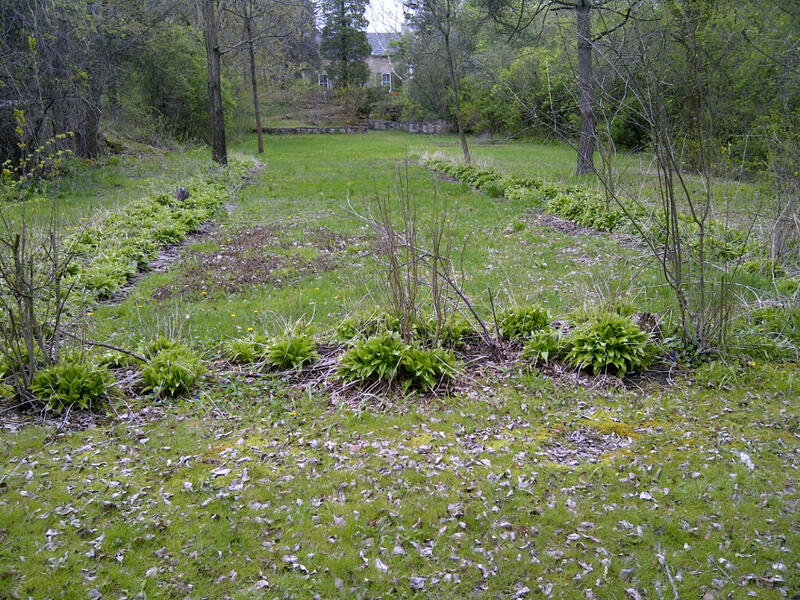 A small “Lily Garden” (which I may or may not have had to climb a fence to find) grows along one of the trails with a pathway in the shape of the Christian fish symbol. Having heard rumours of a “sunken garden” on my last visit here, I went in search of it today. Near the House of the Dove I found what used to be a tended garden, although only the most steadfast hosta and daylily remain. Planted in a giant rectangle it was not hard to see, but the old water tap coming up from the ground was confirmation that I had found the right place. Vegetables are grown here, too. Near the front entrance there is a small cold frame where I am told they grow cherry tomatoes and various herbs during the summer. A couple of raised wooden vegetable beds for more tomatoes are not too far away. On a walk this afternoon I went out to the back of the developed property and found a large patch that is used for growing squash and zucchini, although the snacking of deer and racoon often reduces their yield. All of this is the legacy of Colonel MacLean, the son of a Scottish minister who arrived in Canada in the early 1800’s. After restoring and renovating the Crieff church and cemetery in the 1920’s, he was given the old manse and an acre of land. As his career flourished—he founded MacLean’s Magazine, The Financial Post, and MacLean Hunter Publishing—he gradually bought up adjacent farmland and created a working farm with dairy cows, pigs, grain fields and orchards. It was known for its beautiful landscape and gardens. 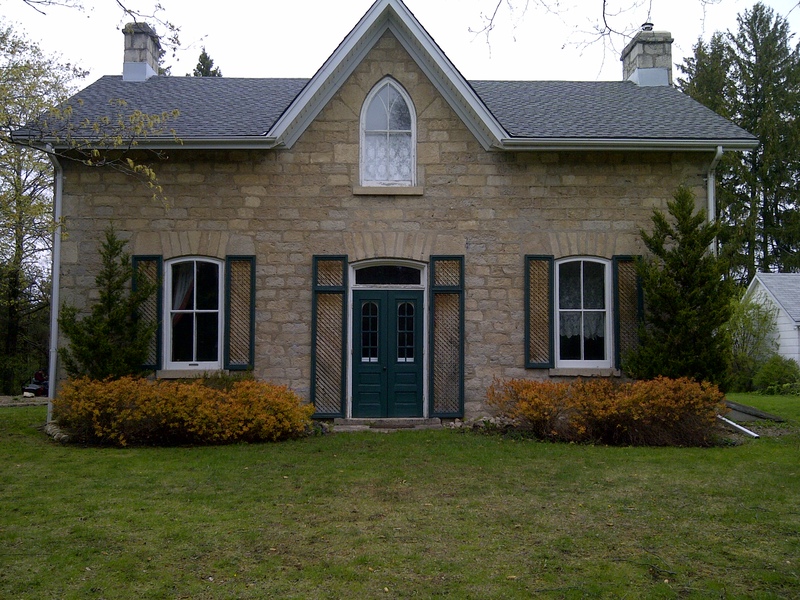 When Col. MacLean died in 1950, he left 250 acres of farm and buildings to the Presbyterian Church in Canada, along with a sum of money, “to maintain and develop the properties as a model and example to other communities”. Since then it has been gradually changed and developed as a retreat and conference centre. As I walked the grounds, I marvelled that all of this is available to me—and others—because of one person. Just one person left this enormous and beautiful gift that every year hosts hundreds of people from all walks of life. I marvel that long after his death, the legacy of Col. MacLean is alive and well. Generosity, it would seem, is a lasting legacy. This entry was posted in Uncategorized and tagged church, garden, gratitude, inspiration, nature, rest, vegetable. Bookmark the permalink. 2 Responses to What kind of legacy will you leave? What a lovely place to have as a retreat. If only I could go there more often–it’s so great to have a spot to get away!